Early Warning: Extreme Weather Possibly Increasing Power Outages? Power outages and disturbances are estimated to cost the U.S. economy between $25 and $180 billion annually and severe weather is a factor in more than half of the outages in recent years. 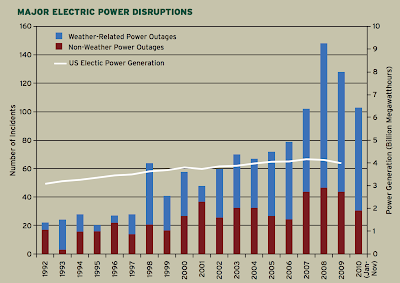 Indeed, major power outages caused by weather have increased from about 5 to 20 each year in the mid 1990s to about 50 to 100 each year during the last five years, with significant year-to-year variability. These major weather-related outages are almost always caused by an interruption in electricity distribution, rather than in electricity generation. 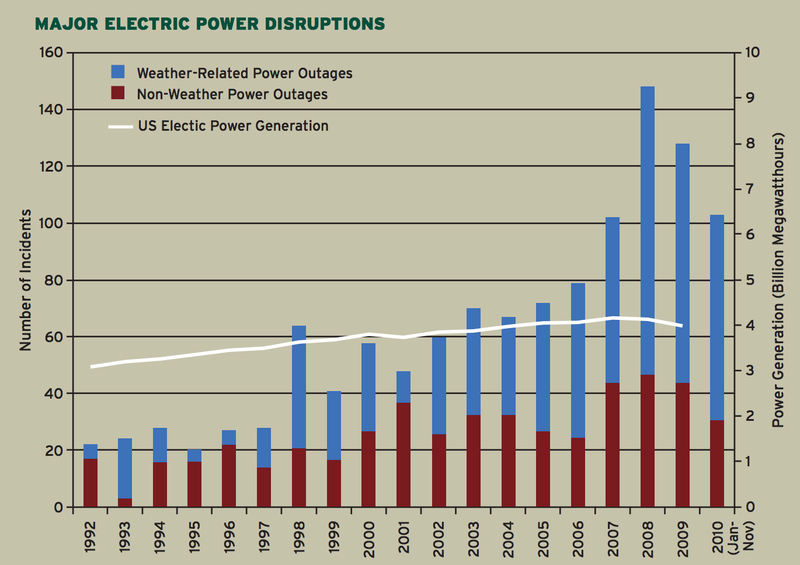 Changes in extreme weather, power transmission infrastructure and maintenance practices, and demographic trends may all be contributing to more frequent power outages. Strong winds are a major contributor in around 80 percent of major weather related power outages. Since the early 1990s, insured damages from wind storms have increased by a factor of 4 to 5, today costing the United States an average of $174 million a year. There has not been a trend in the annual number of catastrophic wind events over this time period, suggesting that either the wind events are becoming more severe or more property has been developed in places vulnerable to wind damage. Some of the biggest outages are caused by hurricanes and other tropical storms, which are expected to have stronger winds and more rainfall because of climate change. Millions of customers can lose power during major storms. For example, Hurricane Ike, which made landfall near Galveston, Texas, in September 2008, left 3.9 million customers in nine states without power, many for a week or longer. The data here are confusing to me, so I'm hesitant to draw a final conclusion. In particular, I'd want to really understand the large increase in non-weather-related outages. But certainly the idea that the extreme weather of recent years is degrading electricity reliability seems worth exploring. But of course suburbs are only part of our landscape. I had also thought that the increasing sophistication of the grid, out beyond and above the neighborhood level, had reduced grid failures, but this data shows that is not the case. Perhaps the grid, being larger, more far-flung, and more sophisticated than ever before, is now more failure-prone, rather than less. I don't discount the possibility of increasingly violent weather, but to me it seems that the outage data is climbing more quickly than the weather is deteriorating - again, speaking anecdotally. I'd be a skeptic. The free-market forces on utilities, defanging of regulators, and general acceptance of degraded infrastructure seem to me more pertinent factors. Perhaps also the expiring lifespan of so much of our infrastructure that was build over the mid-20th century heyday. Yeah, I wonder about the things Burk Braun brings up too. Particularly the idea of degraded infrastructure-- I'd guess the age of the average distribution structure is continuing to rise, but this would be a thing (relatively) easily tested. In particular, I'd want to really understand the large increase in non-weather-related outages. It's not confusing at all: the right-hand axis on the graph has been drawn in a way that makes it confusing. If you imagine the white line (the generation line) at consistently half its graphed height, you will see that non-weather related outages track generation pretty well. It's the weather-related overages that have been exaggerated in recent years.